Contact Zachary B. Cooper, Attorney at Law, P.C. Pennsylvania driving under the influence (DUI) laws are broad, covering a wide range of situations. If you have been arrested for drunk driving, you have the right to contest the charges with a number of potential defenses that may lessen the penalty, obtain a favorable plea deal, or even have the case against you dismissed. Montgomery County DUI attorney Zachary B. Cooper has dedicated his practice to defending people charged with drunk driving in the Philadelphia area and beyond, including in Delaware, Bucks, Chester, Lehigh, and Northampton Counties. He has accumulated substantial legal skills and courtroom experience with which to help his clients pursue outcomes that allow them to continue with their lives. Mr. Cooper can vigorously protect your rights following a DUI arrest and during any subsequent proceedings. Under Pennsylvania law, it is illegal to drive, operate, or be in physical control of a vehicle with a blood alcohol concentration (BAC) level over the legal limit. For individuals aged 21 and older, the BAC limit is .08% or more, and for drivers under 21, the limit drops to .02%. In addition, commercial drivers and school bus drivers are subject to lower BAC limits of .04% and .02%, respectively. The DUI law provides enhanced penalties for individuals with a BAC level of at least .10% and those with a BAC level of .16% or higher. Pennsylvania laws also cover individuals who drive, operate, or physically control a vehicle with controlled substances in their blood. These include any amount of Schedule I controlled substances, Schedule II or III controlled substances that have not been prescribed to the driver, or any drug or combination of drug and alcohol that impairs the individual’s ability to safely drive or operate a vehicle. Penalties for a DUI conviction can vary greatly depending on the number of prior offenses, the defendant’s BAC level, any injuries to others, and other circumstances. In addition to potential jail time, they may include a driver’s license suspension period, probation, fines, drug and alcohol highway safety school or other substance abuse treatment programs, and community service. 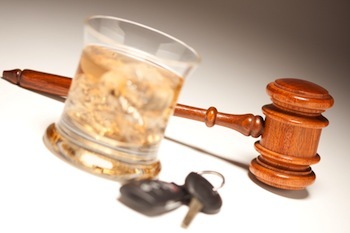 There are a variety of defenses and strategies to contest a DUI, some of which may be available depending on the circumstances of your arrest and the facts of your case. It is also important to understand that you are presumed innocent and that the prosecution carries the burden of proof to prove every element of the crime charged beyond a reasonable doubt. A skilled defense typically includes evidence to rebut the prosecution’s case. For example, evidence that the breathalyzer was not properly maintained, that it provided an inaccurate BAC level, or that law enforcement improperly administered field sobriety tests may be relevant. In addition, evidence offered by the prosecution may be excluded if it was obtained illegally or in violation of the constitutional rights of the defendant, such as if the arresting police officer had no probable cause to initially pull over a driver. If you have been arrested under suspicion of DUI, a knowledgeable drunk driving defense attorney can explain your legal rights and options, as well as craft a strategy to fight back against the charges. With years of experience to guide him, Montgomery County DUI lawyer Zachary B. Cooper has the resources and skill necessary to evaluate your case and represent you in court. He has assisted individuals in Philadelphia and many other areas of Pennsylvania, including Bensalem, Allentown, Chester, West Chester, Easton, and other communities throughout Delaware, Bucks, Chester, Lehigh, Northampton, Lackawanna, Carbon, Luzerne, and Monroe Counties. 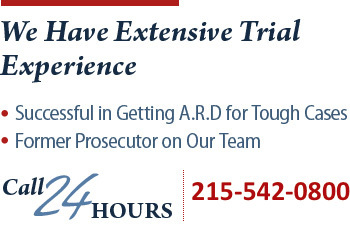 Call (215) 542-0800 or contact us online to schedule a free consultation. We serve the following localities: Philadelphia County, Montgomery County, Delaware County, Chester County, Bucks County, Northampton County, Lehigh County and Monroe County.